No, Apple (Core Image RAW) engine is only available on the Mac platform since it's part of the OS. Unfortunately, Microsoft do not provide a RAW engine with Windows - so all we are left with is our own. The default RAW engine presents exactly what the sensor saw - without doing anything automatically. This often throws people off because most other processors do a number of things (especially noise reduction) automatically. We find that comparable results to other processors can be achieved - admittedly with more effort on the part of the user (at this point in time). Hello, it is true that the SerifLabs raw engine receives criticism because it doesn't perform any kind of initial noise reduction or sharpening by default. Most raw processing software adds a small degree of fine detail sharpening and chromatic noise reduction (sometimes luminance noise reduction too) - so in effect, you're never really seeing how noisy or soft your raw images actually are. As an example, Apple's Core Image Raw engine appears to sharpen the image and perform both luma and chroma noise reduction - retaining the "texture" of the image by adding a subtle layer of gaussian noise. I've been able to practically match the Core Image output using the SerifLabs engine through sharpening, light noise reduction and very light gaussian noise addition - all achievable through the Details panel when you're developing the raw image. This video, Raw Conversion Quality, might be worth a watch (although it's due a re-record, I... talk.... so.... slow....) - it goes into detail about the raw engine and demonstrates how to get the best results from it, including applying your own tone curve to maximise the available dynamic range. Maybe some sort of user defined preset or template functionality could help which could be applied as default starting point, when the user opens a raw. This way the user could set up the settings from the video as default preset. Today's raw tools tend to do more 'Auto' with more or less success. Ah, good to know, thx. I still don't understand why Affinity Photo's RAW engine alters the exposure? I can see it being neutral on color, contrast and sharpening but the RAW file should reflect the exposure how it was taken, because that is a direct correlation of lens aperture and shutter speed? All my RAW files show under exposed when I know they are correctly exposed? 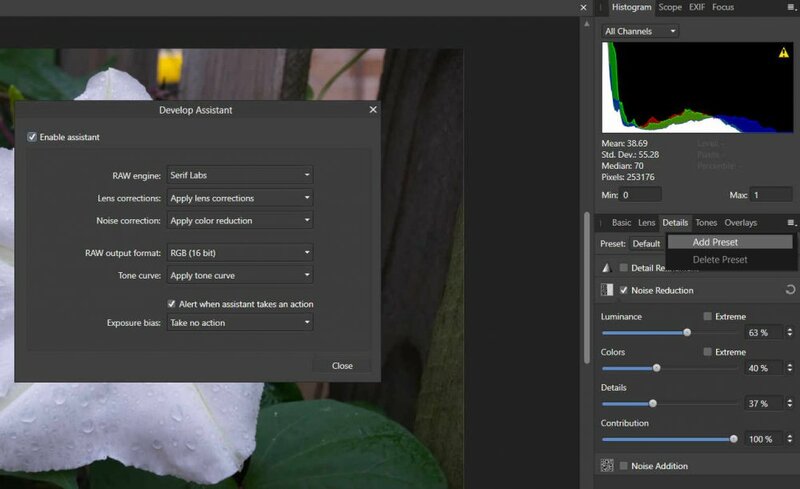 Affinity photo's raw engine does not alter the exposure of the raw image unless you allow the develop assistant to apply a tone curve automatically. It will look underexposed and flat because it is displaying the uncompressed tonal range of the image (more shadow and highlight detail then normal).